A stunning new image of the Carina nebula reveals cold, dusty cosmic clouds where violent and dynamic star formation is taking place. These clouds of dust and gas play host to some of the most massive and luminous stars in our galaxy, which make them scintillating test beds for studying the interactions between these young stars and their parent molecular clouds. The new observations were made with the Atacama Pathfinder Experiment (APEX) telescope, which is located about 16,700 feet (5,100 meters) above sea level at the Llano de Chajnantor Observatory in the Atacama desert in northern Chile. A team of astronomers led by Thomas Preibisch, from the University Observatory Munich in Germany, captured images of the star-forming region in the Carina nebula in submillimeter light. At this wavelength, most of the light that can be seen is the weak heat glow from grains of cosmic dust, the researchers said. 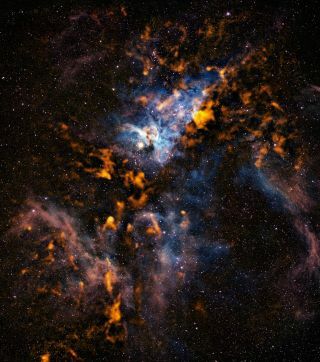 As a result, the image reveals the clouds of dust and molecular gas from which new stars may form. Since the grains of dust are very cold, the faint light they emit can only be seen at submillimeter wavelengths. So, being able to observe the submillimeter light from these cold, dusty clouds is critical to studying how stars form and how they interact with their parent clouds, the astronomers explained. The resulting picture is a dramatic, wide-field shot that provides a jaw-dropping view of the Carina nebula's star-forming regions. The Carina nebula is located about 7,500 light-years away in the constellation of Carina, or The Keel. It is one of the brightest nebulas in the sky because of its large population of massive stars. The nebula is about 150 light-years wide, which makes it several times larger than the well-known Orion nebula. In fact, even though it is several times more distant than the Orion nebula, its apparent size on the sky is roughly the same, making it also one of the largest known nebulas. The Carina nebula's pillar-like mountains of gas took center stage in a famous photo from the Hubble Space Telescope that was released in April 2010 to mark the 20th anniversary of the prolific telescope. The Carina nebula contains stars with a total mass equivalent to more than 25,000 suns. The mass of the gas and dust clouds in the bustling nebula is equal to about 140,000 suns, the astronomers said. But despite such staggering figures, only a fraction of the gas in the Carina nebula is found in clouds that are sufficiently dense to collapse and create new stars within the next million years — what astronomers refer to as the immediate future. Massive stars live for only a few million years at most, which is relatively short in astronomical terms. But, during their lives, they greatly influence the environment around them. As youngsters, these stars emit strong winds and radiation that shape the clouds around them, perhaps even compressing them enough to generate new stars, the researchers said. When these high-mass stars run out of fuel and reach the end of their lives, they typically explode in violent supernova blasts that unleash stellar material into space. Eta Carinae, a bright yellowish star that can be seen at the center of the image on the upper left, is one of the most luminous known stars. Within the next million years or so, Eta Carinae will explode as a supernova, followed by yet more supernovas from other massive stars nearby in the region, the astronomers said. These violent cosmic explosions rock the surrounding molecular gas clouds. But, once the shockwaves travel more than about 10 light-years, they become weaker and could instead compress clouds that are a little further away, which would trigger the formation of a new generation of stars. The supernovas may also produce short-lived radioactive atoms that are picked up by the collapsing clouds, the researchers explained. Astronomers have found strong evidence that similar radioactive atoms were incorporated into the cloud that collapsed to eventually form our sun and planets. As a result, the activity in the Carina nebula could also provide additional insights into the creation of our solar system, the researchers said.